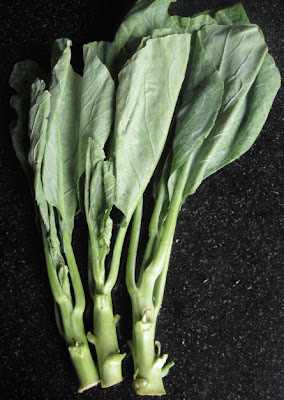 This Evergreen Vegetable is available everywhere, all the time and taste wonderful in my opinion. You will see them Stir-Fry with salted Fish or fried with thick noodle or in Spicy Salad with Shrimps. Thai people will have them is various sizes. The quite small plant, less than one foot tall will be used without peeling the stalk in Rad Na (Fried Noodle with thick Gravy) The middle size is good for Stir-Fry. The biggest Kale, the one with thickest Stalk will be great for Salad (stalk and young shoot only). The big green leaves could be used for Miang Ka Nah as well.